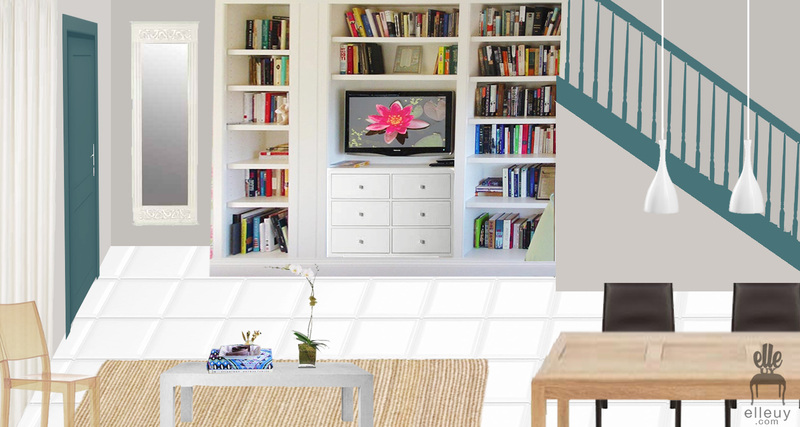 Another project I've been working on is an update on this old but very cozy townhouse. 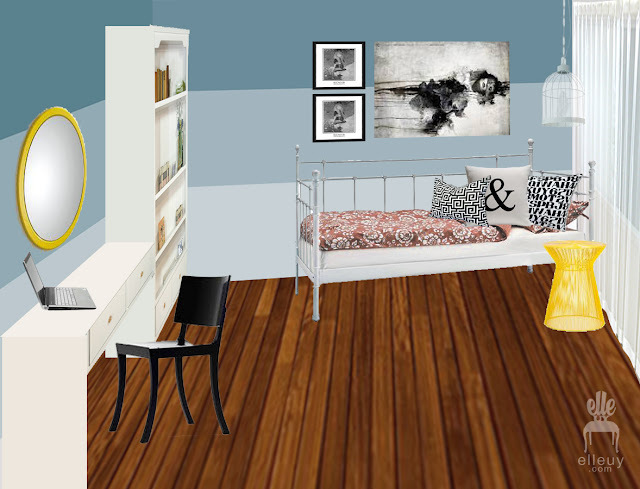 I'm working on the master bedroom, walk-in closet, teen girl's room, and the living/dining space. I love this project cause it clearly shows how a few coats of paint and decor updates can totally change the look of your home. But that is for another post. For now, here are the before photos and the plans for the space. We have a blank canvas for this room. All white waiting to be transformed. The plan is to have a creative space for this teen. She doesn't want a typical pink girly girl room, but wanted it in hues of blue. So I went ombre with the walls. Simple white furniture, with black and yellow accents. This space has been neglected and its about time for an overhaul. The basic needs are there: bed, seating area, tv (for me TV is a basic need! haha) but style wasn't, except for that cute little chandelier. The client loves the crisp look of black and white so that's where we're going with the bedroom. Grey walls, black doors, trims & accents, with some colorful artwork. She wanted it to be as gender neutral as possible with a bit of softness here and there. This is actually a really nice space. It's cozy, it has nice drop lights, but the client wanted to make it lighter since all the furniture is too dark. Light, breezy, airy, and fun is the look we're going for. The only furniture we're getting is the sofa. We'll be repainting the buffet and dining table. A simple nice wallpaper to set the mood. P.S. At this very moment, I still have no idea what to call this project. So I'll sit here, watch Wedding Crashers on HBO, and post this when a project name comes to mind. Please come soon. P.P.S. Movie's done. Still nada. P.P.P.S. After more than an hour of watching and cleaning, came up with "Townhome Charm." Simple but very much describe this house and the community where this house sits. Goodnight! 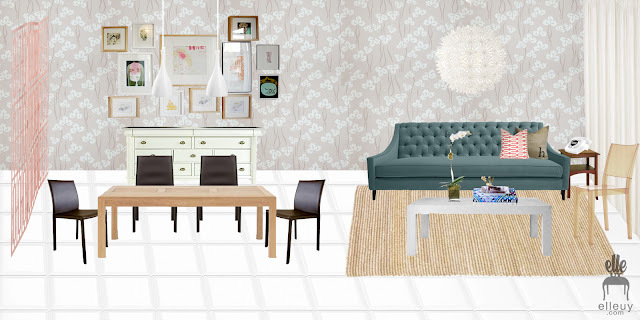 I've been following your blog for a while and love all the things you've done to those room. Can't wait to see these ones come up with! Hi Elle, how do you make your moodboard? Is there an application for it? I'm not a techie person though.